Itumeleng sniffed the air, wary and alert for any sign that her presence at the watering hole might be challenged. Meerkats and mice scurried through the underbrush, and water lapped against the reeds near the water’s edge. Life on the savanna for a zebra was good, if filled with occasional moments of panic, especially when Ditiro the cheetah was skulking nearby. Although it was peaceful now, it was only a matter of time before danger arose. Just then Itumeleng heard a crashing on the outskirts and realized that Otsile and his two friends had arrived. “Rhinos! Bullies the lot of them.” she snorted. Itumeleng knew they wouldn’t harm her, or the other smaller creatures, but they’d certainly make life miserable while they crowded around the rippling waters. As she loped away, she wished that Isilo and his herd of magnificent elephants would come to chase away Otsile, as she herself was being chased away. “It would only be fair…” she thought. Nice one, but no. 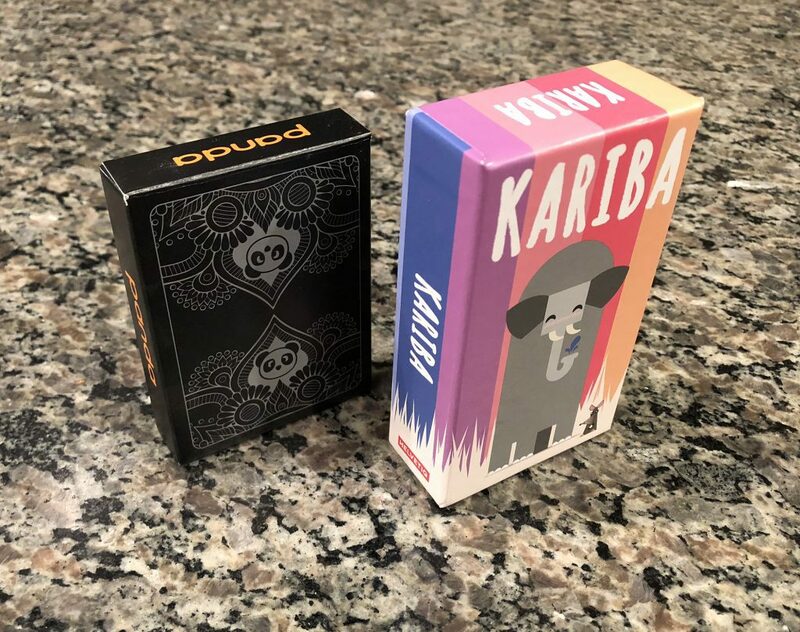 Karuba is a game from Rudiger Dorn, but that’s not what we’re here to talk about. Kariba on the other hand is a cute and clever little game from Swiss publisher Helvetiq, and master game designer Reiner Knizia. In Kariba players aim to bring their animals to the watering hole, while scaring away other smaller creatures at the same time. Collect those animals for points, and hope you’re more clever than your opponents. The box for Kariba is small, smaller than a smartphone in fact, but about twice as thick (you just picked up your smartphone didn’t you?). Kariba’s box is dripping with cute; a smiling cheerful geometrically shaped elephant stands next to a tiny mouse, everything in a beautiful rainbow of pastel purples, pinks, and oranges. Open up the box and shuffle through the deck of 64 narrow cards (each ⅔ the width of a poker card) and you’ll find that the color scheme continues throughout. 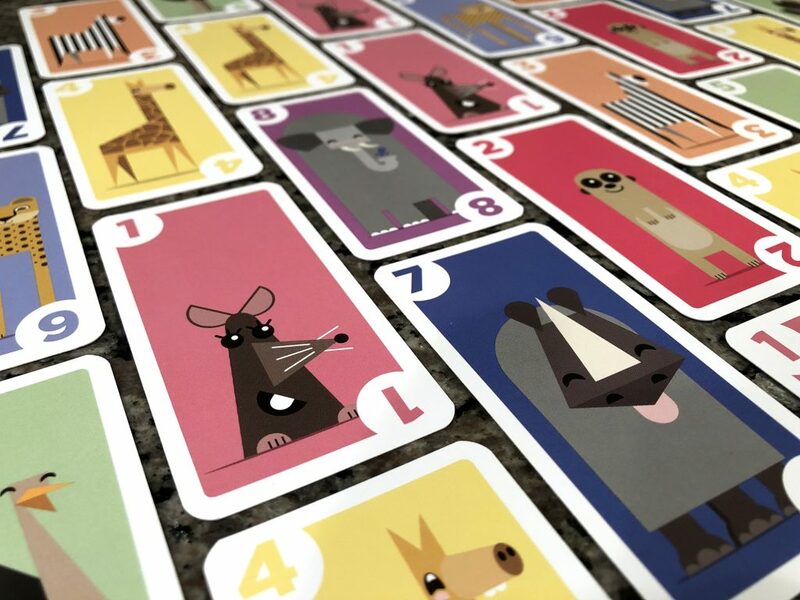 There are 8 animals in the deck; from the mouse and meerkat, through the giraffe, all the way up to the elephant. Even though life on the savanna can be tough, all of the animals are smiling and happy, probably because the unspoken law of the watering hole keeps them safe. For the time being that is. Unfold the watering hole and place it in the middle of the table. Shuffle the cards thoroughly then deal 5 to each player, placing the remainder of the deck in the center of the watering hole. 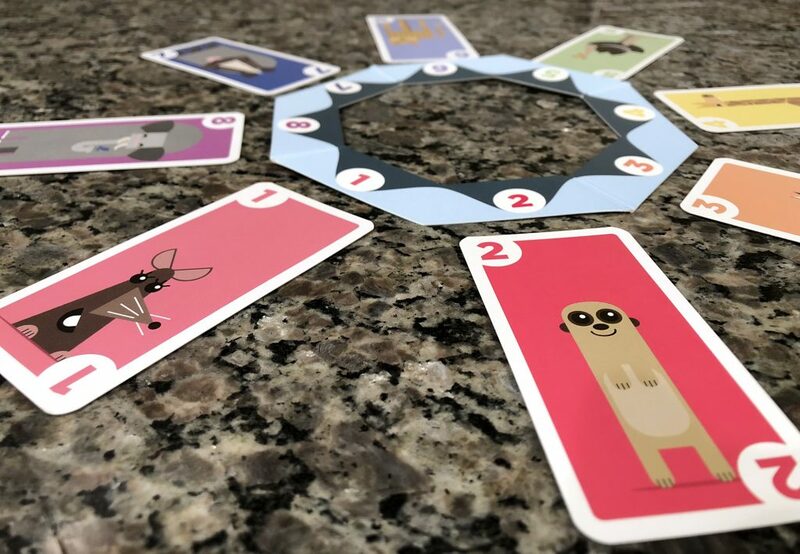 On their turn players must lay down between 1 and 5 cards of a single animal from their hand, placing them in the correct slot around the watering hole. If, after playing their selected cards, the animal they just laid down has 3 or more cards in its stack then they will scare away the next lowest value animal. All of the cards from that lower value stack are collected and placed into their scoring pile. Elephants (number 8) are able to scare away any lower animal, while mice (number 1) can only scare away elephants. Players draw back up to their hand limit of 5 and then the turn passes to the left. Play proceeds, laying down cards and collecting stacks, until one player runs out of cards. At that time the game is over and players will count the number of cards in their scoring pile. The player with the highest number of cards is the winner. This was the first game I played from Helvetiq. The box immediately drew me in with its small size and fun art. Kariba it seems is taking direct inspiration from the small box line of games from Oink: signature titles like Deep Sea Adventure and A Fake Artist Goes to New York. These small box games don’t sacrifice gameplay for size; if anything they’ll amaze you with just how much fun they can pack into their diminutive dimensions. Kariba’s gameplay is tactical, and you’re often playing fewer cards than you could in an effort to outsmart your opponents. Just because you can play 3 of one card doesn’t mean you should. It’s not worth playing 3 cheetahs if you’re only going to net 1 ostrich. Especially when there’s a drool-inducing pile of zebras waiting just on the other side. But by the time the turn comes back around to you, the chance might be lost. In Kariba you’re constantly evaluating just how much you’re willing to sacrifice to make a good play. It’s a delightful push and pull between your opponents. You never want to lay down enough cards to allow them to grab the stack you want, but you need them to play just one rhino so that you can set yourself to collect all the giraffes on your next turn. The only thing negative I have to say about the game is the watering hole piece. It’s folded cardstock and I’m concerned that over time it’ll rip or disintegrate. The good thing is that while it’s the centerpoint of the game, it’s not essential and could easily be replaced with a handwritten piece of paper. Kariba is a clever game, and lasts only 10 minutes or so. It’s a perfect size to keep in a backpack or purse, and since it doesn’t take up much room on the table you can play it just about anywhere. It’s family and gamer friendly, and is well worth a look. If you get a chance to grab this one, you won’t regret it.